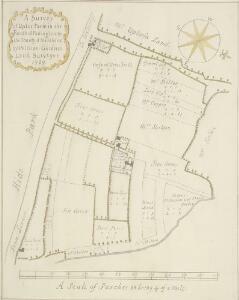 Description: This is a 19th-century copy of Gardner's 1729 plan of Upton Farm.The title appears at top left, with compass rose at top right and scale bar at the foot of the sheet.The plan shows field boundaries, the dimensions of each field, names of tenants and describes different kinds of land use. Paddington remained a predominantly rural area until the end of the 18th century, when the Bishop of London granted the Grand Junction Canal Company permission to extend the canal from Brentford to Paddington. The Paddington Estate Act also allowed developers to start building on the estate.